Hair color is an enjoyable exploration. It is one of the first stops for experimenting when someone decides to big chop. This is a great opportunity to become the ice blonde or rich auburn that you have always admired, but before you seize the moment consider the pros and cons of color treatments. Permanent color can be quite demanding as your hair needs change and here is what to expect. Fading is inevitable. Over time the color begins to fade with every wash. Some women maintain their color with regular touch-ups or temporary color rinses. Permanent color upkeep is easier to maintain on shorter hair because the hair is being cut more regularly, leaving less concern about over processing the length you are trying to retain with longer hair. Although color is applied to the roots for touch-ups, the length of the hair is still getting slightly processed with every rinse as it runs down the length of the hair. The quality of the color, proper mixing, and application will determine how well the color retains, but nonetheless your color will look different over time. Reds become browns and blonde become less vibrant. How well your hair withstands potential color damage and brittleness is determined by the condition of the hair prior to color and maintenance. Since permanent color naturally makes the strands more porous, your hair might be calling for a regimen update. Since permanent hair color naturally makes the individual strands more porous, the color treated portion will be drier; if not immediately then certainly over time. These could mean multiple things: new regimen, new products, or new hairstyles. Depending on your individual hair needs, sometimes the dryness can be kept at bay with an increase in deep conditioning, adding a pre-poo treatment, or being more adamant about sealing your ends. For others this might mean completely different products, maybe even products specifically formulated for color-treated hair. A great addition is a protein treatment to strengthen your hair from the color process. If you are trying to maintain your color and retain length, then you may have to opt for more protective styles to better preserve your ends. All of this will be determined by trial and error. With increased dryness come more trims. I have never met anyone who was growing out their hair color and did not feel a texture difference between the virgin hair at the roots and the color treated portion. If your goal is to retain more length, then you may have to trim more frequently as oppose to your regular trims due to brittleness and split ends to prevent the damage from traveling up the hair shaft. This is ever so slight and does not occur to everyone, so please do not attempt to use a color treatment as a means to texturize your hair. It won’t happen. A lot of women who consistently color experience this and some experience it after the first application. 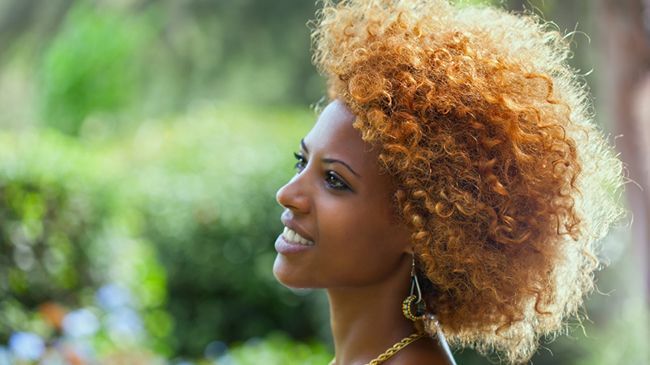 Since permanent hair color breaks down the protein bonds of the hair, the curl pattern begins to loosen over time, and in many cases this can be a sign of chemical damage. The best way to avoid this is to stretch your touch-ups. How did your regimen change after you colored your hair?